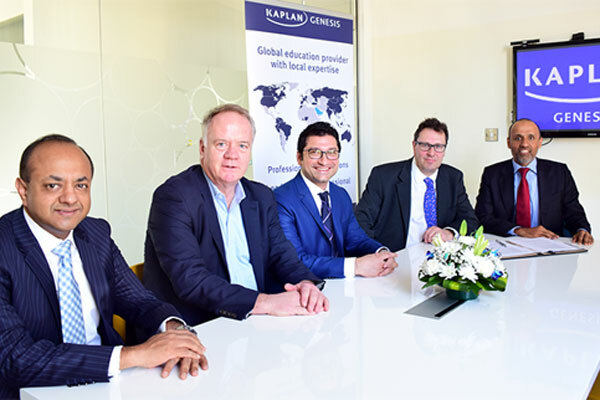 Kaplan, a leading international provider of training and education services, has acquired Genesis Institute, a leading provider of financial training solutions, to further facilitate training and development in the Middle East region. Genesis Institute, founded ten years ago in Dubai, UAE, leads the CFA examination market in the UAE, said a statement from the company. It was set up by highly qualified and experienced professionals who are passionate about the delivery of relevant, high quality and effective financial education. Genesis will now be able to integrate the world-class Kaplan Schweser CFA materials into its already exceptional CFA programmes, stated Kaplan UK chief executive Peter Houillon after signing the agreement with Binod Shankar, the managing director of Genesis Institute, at the company headquarters in Dubai. As per the deal, Genesis and its team will trade under the name Kaplan Genesis and will continue to be based in Dubai and operate across the GCC, he added. The organisation will also offer preparation for other financial and business qualifications, as well as leadership and professional development programmes for corporates. Houillon said the combination of Kaplan’s distinguished learning heritage and global reach with the Genesis brand and local expertise provides exciting opportunities to build a highly competitive offering. "Many of Kaplan’s UK and US clients, already with a significant presence in the region, will benefit from our combined expertise and global network," he noted. Andrew Perkins, the global director of Kaplan Leadership and Professional Development, said: "We approach learning and development differently: we combine the development of technical competence and behavioural confidence that enables better decision making by individuals, team and organisations." "We will now tailor these programmes to support the development of regionally based talent for our GCC, UK and US clients," he observed. Shankar said: "Being part of Kaplan gives us the resources and infrastructure to enhance the fantastic student experience we have worked hard to create at Genesis. This is great news for our current and future students." "As per the UAE's Federal National Council, the budget for 2017 is set by the cabinet at Dh48.7 billion ($13.3 billion) with a prime focus on education. About 20.5 per cent of the 2017 budget, or Dh10.2 billion ($2.7 billion), is earmarked to the education sector," explained Shankar. Given the UAE's fast-paced growth and the government's vision of promoting innovative education as a drive for the future, this decision has opened new opportunities in various fields and programmes," he said.